Usually I talk about two colours that complement each other well but when I came across this polka dot stripe combo I had to share it! Bold prints are super popular right now and wearing a mash-up of prints is also becoming very trendy if you haven't already been trying it. Aside from all of that black and white is hotter than ever right now so there is no better time than now to rock this look!! I understand this is very bold and may intimidate a few of you but if you like it try wearing a stripe button up blouse underneath a polka dot sweater. Allow the stripes to peek out at the sleeves and at the collar and voila! Check out below how you could take this look from day to night. Tip: A punch of colour somewhere is highly recommended. I love that you used these two prints together! such a nice combo! love it! Wanna follow each other? It would be a pleasure and we could keep in touch though! I would be very pleased about it! Great combo! Love the casual outfit! I LOVE this combination! Great! Thank you for your comment on my blog, maybe we can follow each other on bloglovin? Let me know. 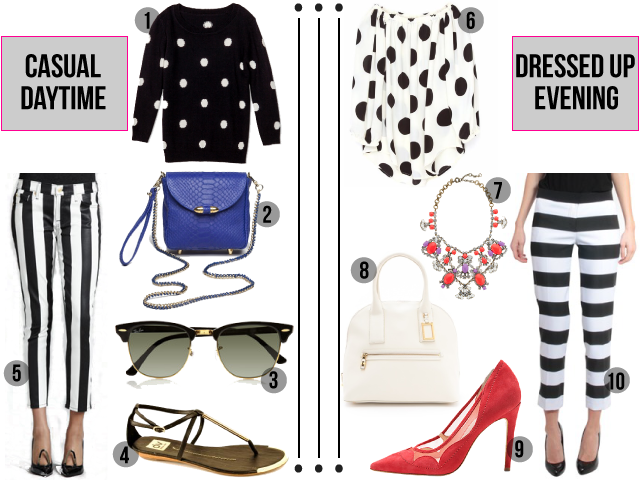 Love the stripes and polka dots combo! definitely an inspiration for me too!